The purging and packing continues as we get closer to moving day. 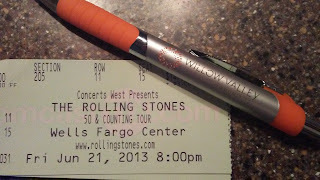 Today, while cleaning out the bookshelves, we found these tickets from The Rolling Stones concert we attended in 2013. All of a sudden, John noticed the section we were seated...205. Our new apartment home number is 205! Talk about meant to be! We can't wait to settle into our new home - Willow Valley Communities. You can read about the wonderful new place we will be living here - Willow Valley Communities We will be residing in Providence Park, in the just completed The Vistas ! One more step on this exciting lifetime journey - together!